The Lily Iron Bed | Wrought Iron & Brass Bed Co.
Our spectacular Lily Iron bed, was named after our friends Peter and Linda’s second daughter. 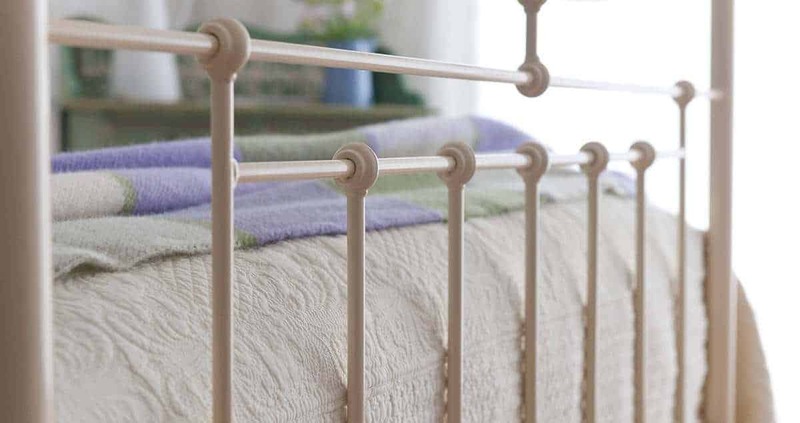 Lily’s downward sweeping curves and elegant cast iron fittings make this one of our most elegant iron beds. If you are looking for a magnificent iron bed that can be easily dressed up or down then this is the perfect choice for you. This particular iron bed has a strong, sturdy feel and is perfectly suited to both a sprung bed base or an unsprung bed base. Creating your own relaxing space with an iron bed that is guaranteed to last you a lifetime is very important. Our Lily iron bed is available in single, small double/4 foot, double, kingsize, superking and a day bed – therefore you are guaranteed to fit one of our beautiful Lily iron beds in your bedroom, b&b or hotel.